There’s a lot to consider for your Tampa wedding–the color scheme, the food, and the weather. But even if you get all of these rights, your music can make or break the event. If you want your wedding to have a live band and entertainment that your guests will remember, do your research to hire the best live wedding band in Naples and Tampa area. Check for references of the band you’re interested in. You can ask the band directly, or you can check out the bands on wedding forums like The Knot or Wedding Wire. Brides like to gush if they’ve had good service so you’ll receive some honest advice for your Tampa wedding. Asking other wedding vendors about their opinions of bands are great too. Some vendors receive ‘kickbacks’ for offering certain vendors, so always make sure to ask a number of vendors in the area to get honest recommendations. Determine what kind of band you want. Not all bands have the same repertoires. Country band won’t know the same hits as a Motown band. If you’re trying to incorporate all types of music that both you and your fiancé like, as well as your guests, consider booking a versatile live wedding band. Ask if they play everything, including Disco, Pop, Rock, Country, and others. You can also check if the band will learn to perform any special requests you may have so you can guarantee your favorite songs will be played. Choose a band that entertains well. 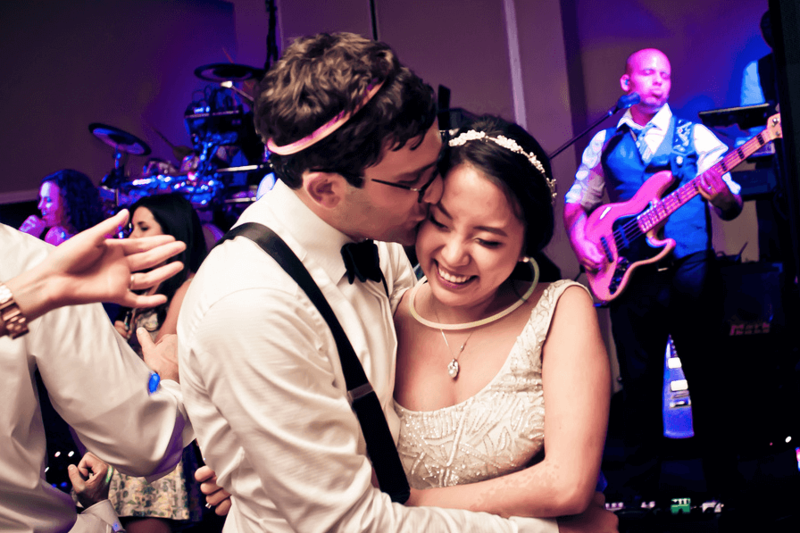 Choose a band that works the crowd well, as the bandleader will double as your MC at your Tampa wedding reception. You’ll want a band that not only sounds great, but can be energetic, read the audience, and get them moving and singing on the dance floor. Ask to see the band in action at another event. We encourage you to check out our live band, None Other, in action to truly get the feel of us. This way you can check out our 6 to 15 piece band and see our six vocalists, as well as see our high quality lighting and sound system and how it all comes together. Just contact us and you can attend one of our upcoming events or weddings for a free sneak peek. Choose a band you feel comfortable with. Since the wedding music is such a large part of your wedding, make sure you choose a band you trust and feel comfortable with. At the beginning, a professional wedding band should offer a complimentary consultation to discuss fitting your expectations with the band’s repertoire. If we can help you create your Tampa wedding day and make it a memorable event, please contact us at Wiley Entertainment.